Moving to a new place, especially to a completely new country, can be challenging. But, if your new residence is in Bordeaux, consider yourself lucky, since this French town is well known for its high standard of living, beautiful surroundings, and friendly citizens. Located just a few miles from the Atlantic Ocean, in a picturesque part of France, Bordeaux is blessed with the Atlantic climate of warm summers and mild winters. Although it has its share of rainy days, most expats will say that the weather here is just perfect for relaxing and enjoying your free time. Strolling through the ancient streets, alongside the Garonne River, and knowing some of the world’s best known and loved vineyards are only a few minutes away helps you understand why Bordeaux is one of the most popular destinations for expats and tourists. Bordeaux was ruled by the English in the 12th century, for two hundred years before returning to French rule. And, there are reminders of this English influence at every turn, from the magnificent 12th century Cathedral of Saint Andrew with the nearby bell-tower to The Tour Pey Berland, with its 282-step climb rewarding you with one of the best views of the city. You will also enjoy the outdoors, with hot sunny summers with temperatures in the mid to high 60 F and mild winters, but January can be particularly cooler with temperatures of around 59 F. The summer is a perfect time to take advantage of the hundreds of wineries within an hour’s drive, or the beautiful sandy beaches on the Atlantic coast only a 40-minute drive away. In fact, transport connections to and from Bordeaux are very accessible. While there is an airport, the best way of travelling is on the TGV (very fast train) which glides through the countryside at 186 miles an hour, taking you less than three hours to Paris and only six hours from the center of London. And the French rail system SNCF also gives discounts for those over 60. Bordeaux, like all of France, has an excellent health system with easy access to doctors and dentists. In fact, The World Health Organization (WHO) consistently rates France as having the best health system in the world. However, if you are not in the French system it is advisable to have health insurance as an expat. Bordeaux is such a popular city some estimates say up to 20,000 people are moving there each year. It is well worth considering for an enjoyable and active retirement. The economy of Bordeaux is built on wine and aeronautics, and, more recently, technology and telecommunications. If you’re moving to Bordeaux to pursue your career, there is a good chance you will work in one of these fields. To emphasize how important the wine industry is for this region, consider that there are more than 7,000 wineries and vineyards here, all of them producing approximately 960 million bottles of wine per year. The town itself is also the home of Europe’s major wine festival, Vinexpo. Being so close to the Atlantic and residing on the Garonne river has made Bordeaux one of the best-developed harbors in this part of Europe, so it isn’t surprising that the trade market here is strong as well. Furthermore, 9 million tons of goods are transported to and from the city every year. 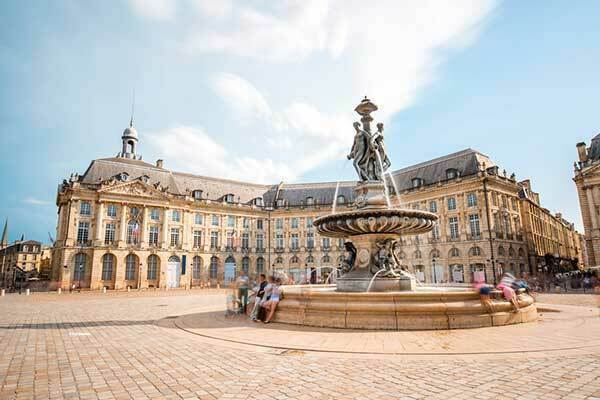 As a university town, Bordeaux has a lot to offer and residents are accustomed to greeting foreigners into their hometown, and their workforce. In Bordeaux, everyday life goes hand in hand with grand cultural monuments. More than 350 buildings, most of which date back to the 18th century are protected as UNESCO World Heritage Sites. There are at least 10 public parks, a public waterfront, and numerous green spaces. Museums are plentiful, as are galleries and concert halls. Yet, one of the more recent tourist attractions is the Miroir d’Eau (or simply Water Mirror) a reflecting pool, which is particularly popular during summer. A significant contingent of foreign students and expats has built a strong multinational community here. As a university town, Bordeaux is quite lively, with a highly attractive nightlife and cultural scene. The liveliest areas can be found around the city center and the riverbank. Needless to say, tourism plays a significant role in the city’s economy and lifestyle. Luckily, as the ninth biggest town in France, the streets of Bordeaux never seem overcrowded. The town is also well connected to other cities in France, as well as other major European destinations. International flights come through Bordeaux–Mérignac Airport, and the main train station, Gare Saint-Jean, is close to the city center. Throughout the town, citizens commute by tramway or electric bus. There is also a ferry that connects the eastern and western parts of the town. Yet, above all else, the most popular vehicle in the town is a bicycle. Bordeaux is almost completely flat and accessible by bike and many people utilize the public bike-sharing network VCUB. One of the greatest things about living in France is the fact that healthcare, social care, and primary education is government funded, and is free for all. Bordeaux International School is popular among expats as classes are held both in English and in French. The University of Bordeaux has a reputation for high standards and is composed of several different institutions. The most notable are the College of Science and Technology and the Institute of Vine and Wine Science, both offering prolific exchange programs. 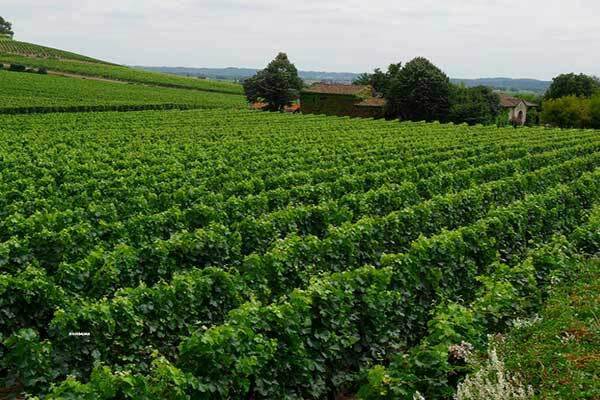 As it is one of the most popular tourist destinations in Europe with its ready access to wineries, beaches, and world class restaurants, Bordeaux has a higher cost of living than much of France. 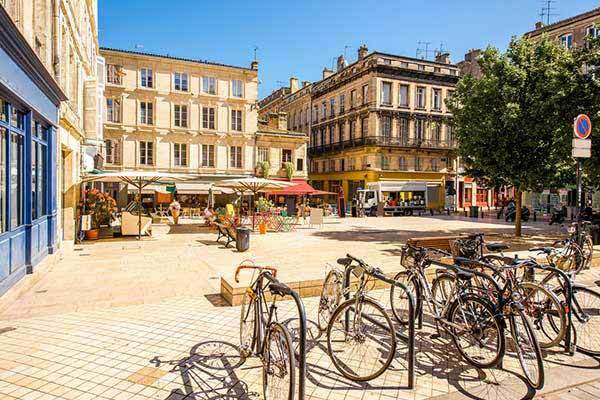 While you’ll find supermarket prices, utilities and communications are similar to the rest of the country accommodation is more expensive in Bordeaux. A baguette from the artisan boulanger (baker) will set you back $1.30, or you can get one from the supermarket for as little as 50 cents, and an excellent bottle of Bordeaux wine for $7. The cost of restaurant meals varies dramatically but you can get an excellent three course meal with wine for two people for around $50. A two-bedroom apartment costs around $800 to $1,000 a month. Regardless of your age, family situation, budget, or profession, Bordeaux is a welcoming city that provides many opportunities and cultural delights that will make you feel right at home in no time.